FARMHOUSE is the original farmhouse on Highlands Farm. Highlands Farm is also known as the South of England Rare Breeds Centre, a tourist attraction offering training to people with learning disabilities. 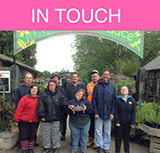 The Rare Breeds Centre is also home to several of The Trusts life skills projects offering involvement in farming, horticulture, catering, art and crafts. There is a sensory room on site. The house is a beautiful old farmhouse with a large kitchen and dining room. There are five bedrooms one on the ground floor and 4 on the first floor. There are two bathrooms and a separate toilet. There is a garden, patio area and of course the lovely grounds of the Rare Breeds Centre on the doorstep. Getting around - Highlands Farm is situated on the B2067 between Hamstreet and Tenterden. There is an hourly bus service to Ashford or Tenterden where there are many amenities e.g. leisure centre, cinemas, shopping centres, library and bowling alley. Ashford has a main line station with trains to London, Canterbury and Dover. The house enjoys use of the Trust's fleet of vehicles.